Administrator Charles Bolden, right, and Deputy Administrator Dava Newman, left, lay a wreath at the Tomb of the Unknowns as part of NASA's Day of Remembrance on the 30th anniversary of the Challenger accident, Thursday, at Arlington National Cemetery. Washington, DC: NASA paid tribute to the crews of Apollo 1 and space shuttles Challenger and Columbia, as well as other colleagues, during the agency's Day of Remembrance on Thursday, the 30th anniversary of the Challenger accident. NASA's Day of Remembrance honours members of the NASA family who lost their lives while furthering the cause of exploration and discovery. 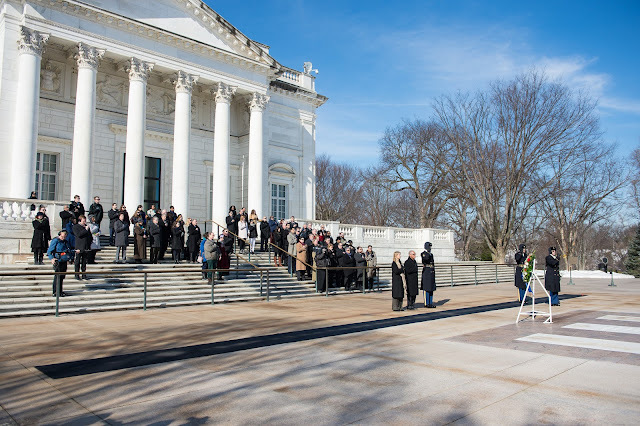 Administrator Charles Bolden, Deputy Administrator Dava Newman, and other agency senior officials held an observance and wreath-laying at Arlington National Cemetery in Virginia. Various NASA centers also held remembrance events Thursday for employees and the families of those lost in service to America’s space program. Wreath-laying ceremony was held at the Space Mirror Memorial located at the Kennedy Space Center Visitor Complex in Florida. The observance was hosted by the Astronauts Memorial Foundation, which is a private, not-for-profit organization. It built and maintains the Space Mirror Memorial, which was dedicated in 1991 to honor all astronauts who lost their lives on missions or during training. It has been designated a National Memorial by Congress. NASA’s Marshall Space Flight Center in Huntsville, Alabama, observed the day with a candle-lighting ceremony for center employees, as well as a public event at the U.S. Space & Rocket Center, Marshall's official visitor center. NASA’s Johnson Space Center in Houston, held an event for employees that included placing flowers at the Apollo, Challenger and Columbia Trees at the center. In partnership with the Challenger Learning Center of Northwest Indiana, agency’s Glenn Research Center hosted former astronaut Greg Harbaugh for the opening of the exhibit “Inspiring the Future -- The Legacy of Exploration,” at the Indiana Welcome Center in Hammond.